In 1872, a site was selected and work began for the erection of the 500-bed, four- story, Gothic Hospital building. The Hospital originated in response to overcrowding at Stockton Asylum, the first State Hospital. 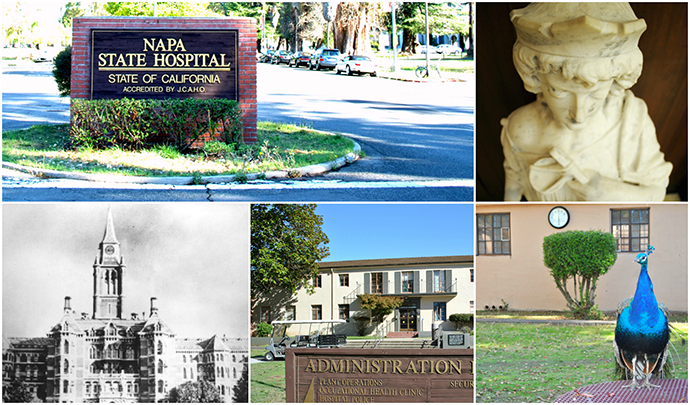 Napa State Hospital opened on Monday November 15, 1875 and is the oldest State Hospital still in operation. The Hospital was once self-sufficient, with its own dairy and poultry ranches, vegetable gardens, orchards and other farming operations. Treatment programs for developmentally disabled residents were present from October 1968 to August 1987and from October 1995 to March 2001. The Hospital does not accept voluntary admissions. The majority of civilly committed patients are on Conservatorships, even though we have some patients that are admitted for evaluation and treatment under Welfare and Institutions Code Section 5150. Conservatorships are for gravely disabled individuals who represent a danger to themselves or others due to mental illness. They have not been charged with crime, but are instead referred by local community mental health programs through involuntary civil commitment procedures pursuant to the LPS Act, typically because they cannot be treated in community facilities. LPS patients are discharged when either their county places them in a different facility or they have met their discharge criteria for a lower level of care. In some cases, patients are discharged because they have successfully petitioned the court to remove the Conservatorship. Felony defendants found incompetent by a court are placed in a State Hospital where the focus of treatment is to stabilize their condition and establish trial competency, so they can return to court to adjudicate their pending charges. Patients who are determined to be unlikely to regain competency are returned to court to determine their future Conservatorship status. Parolees who committed one of a specified list of crimes and who were treated for a severe mental disorder connected to their original crime can be committed to a State Hospital as a condition of parole for a period not to exceed the length of their parole term. If the person still requires treatment at the end of their parole term, they can be civilly committed under PC2972, providing it is determined that they are a substantial danger to themselves or others. These commitments last for one year and may be renewed annually by the court. Patients judged by the court to be not guilty because they were insane at the time of the felony crime are committed to a State Hospital for treatment for a period equal to the maximum sentence of their most serious offense. Treatment efforts focus on addressing their current symptoms, diagnosis and treatment participation, as well as preventing aggressive behavior with a goal of developing socially responsible behavior and independent living skills, while treating their underlying mental illness. The approximate patient population breakdown for DSH-Napa as of 11/7/2016 is listed below. The data below includes patients who are not in the facility because of a court appearance or who are at a general acute care hospital to receive other medical treatment. Approximately 2,335 employees work at DSH-Napa, providing care and services twenty four hours a day, seven days a week. The clinical staff includes psychologists, psychiatrists, social workers, rehabilitation therapists, psychiatric technicians, and registered nurses to name a few. Administrative staff classifications include hospital police officers, dietetics, custodial, warehouse Information Technology staff, as well as many other positions that serve to support the large hospital infrastructure. Patients are screened prior to being scheduled for admission to ensure that DSH-Napa is the appropriate treatment setting. One treatment program is outside the Security Treatment Area (STA) for primarily civil commitments and four programs are inside for forensic commitments. On arrival at the residential unit, staff orients the patient to the unit and members of the treatment team meet with patients and continue the assessment process and develop treatment plans. Once developed, the plan is reviewed regularly by the treatment team and updated as the patient progresses and treatment objectives change. Family, significant others, conservators, CONREP and the courts may play a role as the patient moves through the continuum of care from admission to discharge. Units have a focus on a particular population and treatment. In addition to the living units there are other service sites. Mall Services provides a variety of off unit services for patients. Vocational Services provides opportunities for patients to develop job skills and habits, as well as earn funds. Educational Services enables patients to continue their education, high school or college, and provide skills groups for anger management and development of interpersonal skills. Rehabilitation Therapy Services, facilitated by Music, Dance, Art, Occupational and Recreation Therapists, provide treatment groups to engage the whole patient in wellness and improved quality of life. Medical Ancillary Services provides clinics to provide a number of medical services including but not limited to physical, occupational and speech therapies as well as dental, podiatry, neurology, cardiac and obstetrics and gynecology clinics. The goal of treatment services is to assist patients recognize and manage psychiatric symptoms. Patients also work on developing socially responsible behaviors, independent living skills and coping skills to address their mental illness and forensic issues. Admission units, focused on completion of initial assessments and initiation of behavioral stabilization. Incompetent to Stand Trial (PC 1370) treatment, focuses on trial competency treatment, attainment of competency and return them to court for adjudication of pending charges. Patients participate in a wide range of mental health groups and therapeutic activities to assist in addressing symptoms and behaviors that may interfere with their ability to understand the court proceedings and to cooperate with their attorney in preparing a defense. Other commitments proceed from admission units through the continuum of care from stabilization to discharge. During the journey some patients may receive specialized treatment. Dialetic Behavior Therapy (DBT) involves individualized treatment and unit milieu management that focuses on supporting patient's use of DBT skills to minimize harm to self and others. Treatment for polydipsia (intoxication resulting from excessive consumption of fluids). Discharge units focus on skills development for community living and on relapse prevention. Each patient prepares a personalized relapse prevention plan. The treatment teams work closely with the Conditional Release Program (CONREP) towards returning patients to the community under CONREP supervision. Program 4 is outside the STA and serves the civil commitment population and patients with medical needs beyond what can be provided in Intermediate Care (ICF) units in the STA. Acute Psychiatric units serve as admission unit and medical services for more serious physical or complicated diagnostic conditions that cannot be managed on non-medical psychiatric units. Skilled Nursing (SNF) is provided to both civil and forensic patients. The remaining units are ICF units for treatment of patients who manifest episodes of inadequately controlled behavior. These units provide a highly structured treatment environment for re-socialization in preparation for an open treatment setting or community placement. DSH Napa is considered one of the major employers in Napa County. Approximately 34% of employees reside in Napa County and another 49% reside in neighboring Solano County. The Hospital is a partner with both Napa Valley College and Solano Community College. Through the Psychiatric Technician certification and Registered Nursing programs, the colleges have provided, and the Hospital has benefited from, hundreds of graduates over the course of many years. These college programs utilize the treatment units available as DSH Napa for their clinical rotations, affording psychiatric technician and nursing students a unique opportunity to experience the role of nursing staff providers in a psychiatric hospital. The Hospital has developed partnership with various community based organization and currently leases several buildings to support community and mental health services on the grounds. The Hospital hosts local blood drives routinely and sponsors training opportunities through the year. Since 1949, the Hospital's Fire Department has carried out a tradition of delighting children from the neighboring communities with the "Santa's Sleigh Ride," distributing bags of treats prepared by the DSH-Napa firefighters and volunteers.